Check out this great new interactive tool that can help nonprofit directors get information about the giving patterns in every state, county, city and ZIP code in the United States. This is an exciting new tool that can help you out with fundraising. 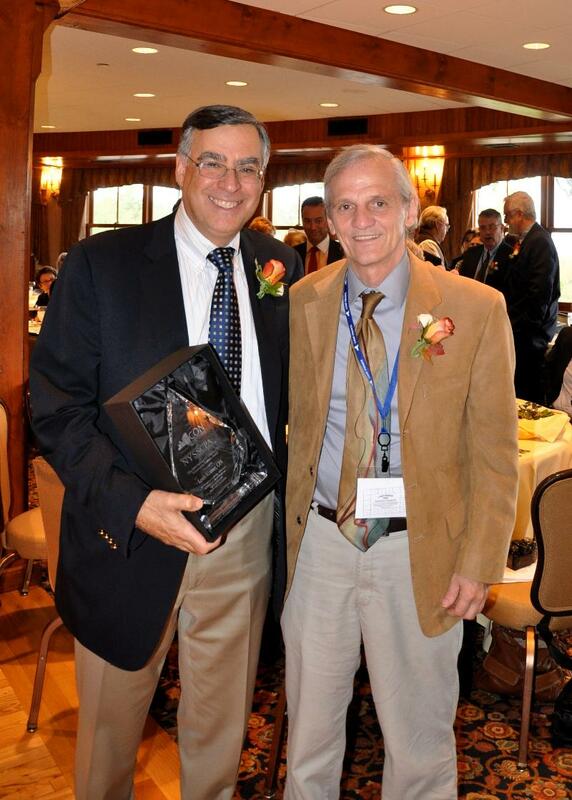 The Health Foundation for Western and Central New York recognizes the challenges many health and human service organizations face in maintaining the quality of the services they provide to young children and seniors during turbulent times. The economic recession, Medicaid redesign in New York State, the Affordable Care Act, Accountable Care Organizations and meaningful use are just a few examples of profound changes that are impacting not only the health care system, but also the communities served by the Health Foundation. For the organizations within our two regions that serve young children and frail elders, keeping up with these changes and their impact is challenging, but essential. The Foundation announced a funding opportunity to help eligible organizations successfully plan for and respond strategically to the ever-changing economic and policy environment on Thursday, August 16, 2012. The Foundation expects that with this one-time infusion of funds, organizations will be better able to provide effective programs and supports to those they serve, and in the long term, ultimately improve health outcomes for children in poverty and/or frail elders. The Foundation expects to make awards ranging from $25,000 to $50,000 to 12 to 15 organizations for up to an 18-month period beginning in December 2012. Currently offer programming, services or care to children ages birth to five living in communities of poverty, or frail elders living in the community. Currently be located in and serve one of these populations in one or more of the 16 counties in HFWCNY’s funding region. The deadline to apply is 5 p.m., Friday, September 14, 2012. For more information, details on eligibility and how to apply, please see the attached Funding Opportunity announcement. Our Mohawk Valley Chapter is seeking a Community Chapter Executive. This position will be located in Utica, New York. As a Community Chapter Executive, you will focus externally on core mission delivery, fundraising and being the face of the Red Cross for the media, donors and their communities. You will have oversight of Red Cross service delivery, external relations, and fundraising within an assigned community. As a Community Chapter Executive, you will be accountable for achieving performance targets for the Community Chapter, including service delivery, fundraising/revenue and expense targets. Responsibilities also include achieving fundraising goals. You will also utilize the support activities of HR, IT, Finance, Communications and Marketing through a matrix project management system to ensure that all operating units have the necessary resources to execute on their community mission. You will act as the chapter’s chief fundraiser. Education: Four year college degree (BS/BA) in Business, Communications, Marketing, Public Relations, Finance or non-profit administration or equivalent experience required. Prefer Master’s degree in the field of community organization, public or business administration or nonprofit management. The American Red is a nonprofit organization that offers employees growth and development; team spirit; a competitive salary; a comprehensive benefits package and free parking. We are an Equal Opportunity/Affirmative Action Employer. EOE/AA and M/F/D/V. 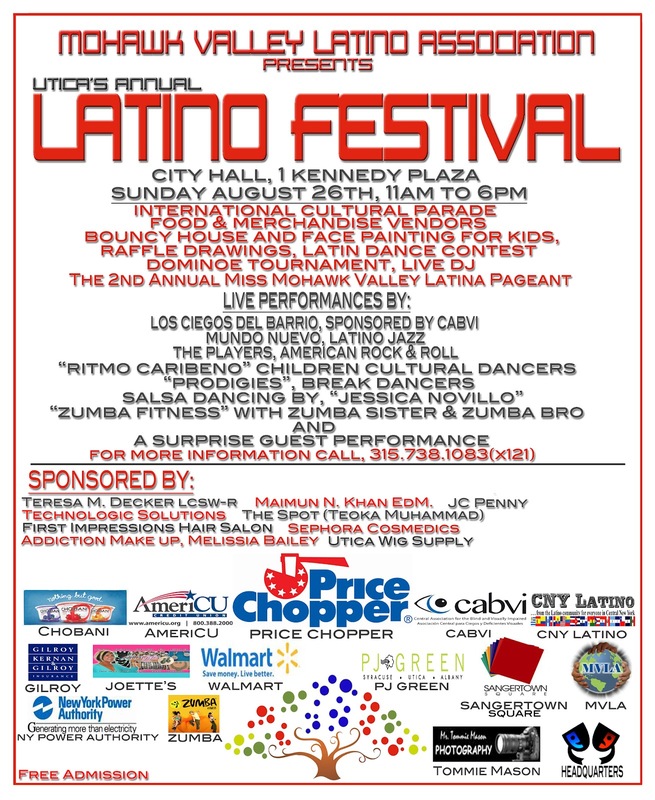 MVLA Executive Board and Members, are proud to announce the 7th Annual Hispanic Heritage Latino American Festival activities, schedule to be held on Sunday, August 26, 11 am - 6 pm, Hanna Park, One Kennedy Plaza, Utica. 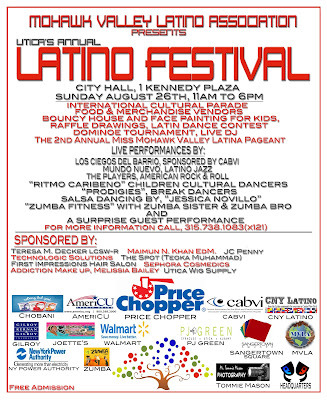 The festival is filled with activities for all to to enjoy and participate throughout the day, please see attach flyer with detailed information. This year, the Young Scholars Program at Utica College received a $43,000 federal grant to help local students graduate from high school. Next year, that program and nearly two dozen other nonprofits may not receive any money due to a change in how the city will distribute its yearly allotment of Community Development Block Grant funds. Nonprofit leaders and community members say taking money away from these programs will hurt residents the grant is meant to serve. Flossie Mitchell, director of the Young Scholars program, said the loss combined with a $150,000 cut this year in funding from the Utica City School District could prove extremely difficult to handle. The changes are based on what the U.S. Department of Housing and Urban Development wants and will focus the funds on areas that need it to produce visible results, Mayor Robert Palmieri said. Instead, the money will likely go to programs that focus on combating blight and revitalizing neighborhoods, he said. On July 2, the Community Development Block Grant Citizens' Advisory Committee wrote a letter to Palmieri asking him to clarify his policy on giving grants to nonprofits. Last week, Palmieri responded, writing that most, if not all, of the funding will go toward helping neighborhoods around the city. Any money for nonprofits will be limited to those that support city-sponsored activities, such as senior centers. In the past, the city typically set aside 15 percent of the grant funds for local nonprofits. The committee, which was created by the Common Council, reviews the applications and makes recommendations to the council, said Gene Allen, the committee's former chairman. The city's yearly grant has been slashed by nearly 25 percent in the last two years, Allen said. This year it received $2.3 million. The city will not know for several months how much money it received for the 2013-14 grant year. A large chunk of the funding goes toward paying loans for previous projects. The rest of the allotment goes toward the funding and staff of the Urban and Economic Development office.